A newly discovered species of monitor lizard, a close relative of the Komodo dragon, was reported in the journal Zootaxa by a professor at UC Santa Barbara and a researcher from Finland. Sweet describes an important biological context: "East of Wallace's Line –– the boundary between Asian and Australian domains –– there are no native carnivorous mammals, and monitor lizards fill that role. There are more species there, doing more different things ecologically than in Africa or South and Southeast Asia, where competition and predation by mammals tend to keep monitor lizards down. 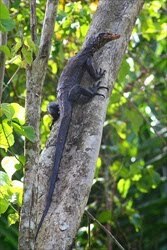 East of Wallace's Line in Indonesia, New Guinea, and Australia, monitor lizards are on the top of the heap. It emphasizes again how little we know about some tropical regions, to find an animal so strikingly colored and so large only last year."